This story has been updated to note that the Environmental Review Commission meeting set for Wednesday is canceled. RALEIGH – In recent sessions, there have been few House and Senate differences on environmental policy as stark as last week’s failure to pass a proposed short-term response to GenX and other emerging contaminants. House Bill 189, the result of work this winter by the House Select Committee on North Carolina River Quality, was effectively dead in the Senate even before the 116-0 vote to pass the measure in the House late Wednesday. 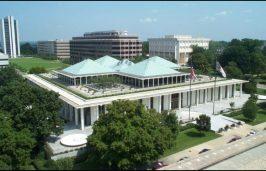 The bill included provisions that were released in draft form late last month calling for studies and program reviews, but when legislators returned to Raleigh last week, a new section was added that detailed spending for $2.36 million in reallocated funds and additional money for the Department of Environmental Quality. Despite the full backing of the House, Senate Majority Leader Harry Brown, R-Onslow, said Thursday he saw no urgent need for the bill. Nor did the Senate have time to consider the DEQ funding provisions, which Brown said were not available until the morning of the session. Brown said he didn’t believe delaying any part of H189 would hurt the state’s response. “I don’t think that bill did anything to hurry anything up at this point,” he said. Senate leader Phil Berger said in a blistering statement following the session that the bill would “do nothing to prevent GenX from entering the water supply,” adding that the additional DEQ funding places the financial burden on taxpayers rather than the company responsible. Berger said the first round of studies required by legislation passed last year is due to the legislature this spring and that the Senate plans to take action during the short session. Brown said that until then, DEQ has enough funding to handle the crisis. 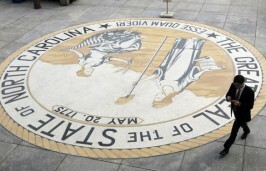 Molly Diggins, state director of the North Carolina Sierra Club, said she agreed that the amount proposed was small compared to the overall budget, but that only underlines the “hyper-partisanship” behind the move. The quick end to the bill and the fallout from its failure highlights what has been a long-running fight between the two chambers on environmental issues. During debate on the proposal, River Quality Committee Chair Rep. Ted Davis, R-New Hanover, said the House had provided DEQ with what it had requested and he emphasized the importance of moving ahead with the purchase of a high-resolution mass spectrometer for the analysis of per- and polyfluoroalkyl substances such as GenX and other compounds. Davis said he hoped the Senate would take the bill as seriously as the House. But by then, several senators were already on record as opposed to the bill. Sens. Mike Lee, R-New Hanover, and Bill Rabon, R-Brunswick, also criticized the process, saying they were not kept in the loop. Brown said that in order to get to a solution in future legislation, the House will have to do a better job reaching out to senators. Davis knew going into the session that the funding measure would be difficult. During its meeting earlier this month to finalize sections of the bill, Davis told members of the River Quality Committee that if the Senate didn’t move on the legislation, the committee would return to working on legislation for the short session. 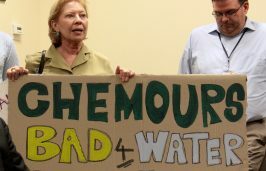 The Senate wasn’t alone in opposition to the bill, which drew criticism from some environmental groups for failing to tackle some the regulatory difficulties DEQ and the Department of Health and Human Services face in overseeing the growing number of unregulated contaminants. 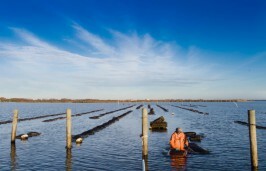 Last month, the Southern Environmental Law Center released a set of proposals, including lifting the Hardison Amendment, a section of state law that prohibits agencies from enacting any regulation tougher than its federal analog. Critics say the amendment creates a regulatory gray area in the case of emerging contaminants and other compounds for which there is no federal standard. Rep. Deb Butler, R-New Hanover, during floor debate on H189 offered an amendment to repeal the Hardison Amendment, which was named after former Sen. Harold Hardison, D-Lenoir, who pushed through a series of bills in the 1970s aimed at curtailing state environmental regulation. Most of them were repealed a decade later, but in 2011 returned in modified form. Butler told her colleagues it was time to take the handcuffs off DEQ. The amendment was defeated 44-71 on a party line vote. Despite the end of the scheduled special session, the General Assembly remains on standby with potential action required under two federal redistricting lawsuits. Work on a judicial redistricting proposal and constitutional amendments also continue. Meanwhile, regular order has resumed at least in part with House and Senate policy committees and joint committees of the two chambers meeting to review studies and work out legislation ahead of the short session in May. The studies include one by the Joint Legislative Commission on Energy Policy, which is reviewing the implementation of sweeping changes to the state solar and alternative energy policies passed last year in House Bill 589. Last week, commission members heard from Utilities Commission Chairman Edward Finley and Public Staff Executive Director Christopher Ayers about new rules being developed for community solar projects, including the development of a new “Green Source Rider” to allow universities, military bases and other large non-residential users to participate in renewable energy projects, and selecting an independent administrator to review bids for renewable projects. The commission also reviewed the legal impasse over the state’s Oil and Gas Commission, which was declared unconstitutional in 2016 after a court battle between then-Gov. Pat McCrory and the General Assembly leadership. The commission, set up by the legislature under the 2014 legislation that lifted a ban on inland oil and gas exploration, was charged with drawing up new rules for hydraulic fracturing, also known as “fracking,” and other exploration related operations. Although, it was put out of business by the state Supreme Court, it was revived and its role further defined in legislation passed in 2016. But the commission remains in limbo in part over legal challenges and in part because a membership dispute. 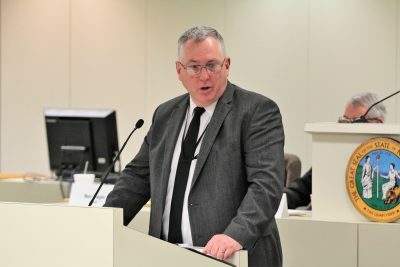 Energy Policy Commission co-chair Sen. Paul Newton, R-Cabarrus, urged DEQ, which is required to provide staff and support for the group, to begin setting up the structure. He said while it is apparent that market forces make it unlikely that exploration in North Carolina would happen anytime soon, without that pressure, the state has an opportunity to take a thoughtful approach drafting new rules. Also holding interim meetings and working on legislation on solid waste programs is the Environmental Review Commission, which met only once in 2017. The commission met last month to discuss DEQ’s use of solid waste disposal tax funds for cleanup of older landfills built prior to reform legislation passed in the mid-1980s. The ERC was scheduled to meet again at 1 p.m. Wednesday but the meeting was canceled Tuesday because of expected inclement weather. DEQ Chief Deputy Secretary John Nicholson said at the meeting that the department stands ready to assist the commission once the membership issues are worked out. Right now, he said, there are only five members of the commission. Last fall, four of the nine members left the commission and two of Gov. Roy Cooper’s picks are still waiting to be confirmed by the legislature.